Mast-o-khiar is a scrumptious classic Persian salad of cool cucumbers with creamy yogurt, and infused with fragrant herbs. Presented here in two ways – as a traditional salad and in a modern appetizer style. It makes a great Persian style appetizer that is quick, easy, vegetarian, low carb and gluten free. Here I share with you the classic recipe of mast-o-khiar as a simple salad. 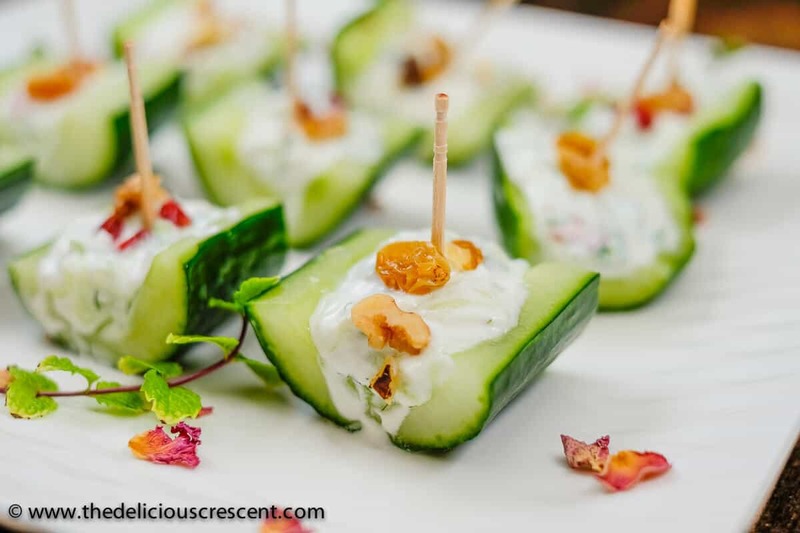 And I also present a slightly modified version to serve the salad as an appetizer in the form of little cucumber yogurt salad bites. Easily picked up with a tooth pick! The classic version is simply a combination of thick creamy yogurt, cucumber and herbs. And for the appetizer style, I suggest serving small portions of the yogurt salad in little hollowed out cucumber boats, finally embellished with a variety of toppings. Another popular Persian cucumber salad that is not yogurt based is this crisp Salad Shirazi. And then there is the Mediterranean spiced lentil salad with some cucumbers in it. 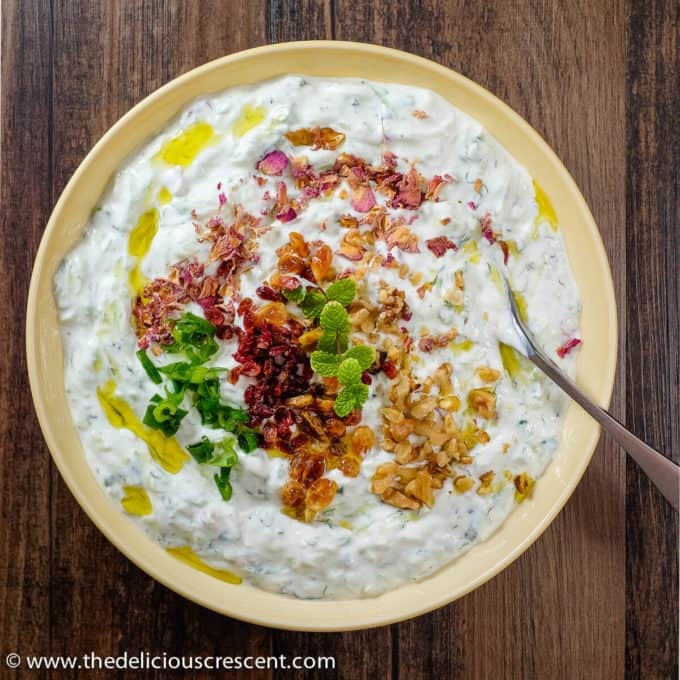 If you like shallots, then this Mast-o-musir (yogurt shallot dip) is an “absolute” must try! More yogurt based salads are my eggplant yogurt salad and yogurt chickpea salad. Cucumbers seem to pair perfectly with yogurt not just in terms of taste and flavor but also nutrition wise. With 95 percent water content, cucumbers are low in calories, carbs, fats, cholesterol and sodium. So they effectively balance and bulk up a yogurt rich recipe. Due to the content of water and electrolytes, cucumbers are great for hydration. Cucumbers are also a good source of vitamin K, potassium and vitamin C. They also contain lignans, that have been associated with a reduced risk of cardiovascular disease. And finally, cucumbers are a source of cucurbitacins, that are phytonutrients known to have anti-cancer properties. Yogurt is a good source of high quality protein, calcium, vitamin B 6, vitamin B 12, potassium and magnesium. It is well known for probiotics, the healthy bacteria that benefit the gut. Hence, yogurt with active cultures is considered to be beneficial for certain gastrointestinal conditions such as, constipation, diarrhea, irritable bowel disease, lactose intolerance etc. Some probiotic strains may also boost the immune system. Other health benefits attributed to regular consumption of yogurt are prevention of osteoporosis, lowering of the risk of high blood pressure and better weight management. It is essential though to make sure to buy the right kind of yogurt. The one that does not have added sugars and has not gone through processing, which leaves no active cultures in the product. Yogurt has a low amount of lactose, and so may be better tolerated than milk, by a lactose intolerant person. Use thick Greek style yogurt. Make sure to drain the grated cucumber if making the yogurt cucumber salad to serve it in an appetizer style. The typical preparation of mast-o-khiar does not include the use of raisins and walnuts. But these may be used, as per preference, especially for the appetizer style cucumber salad bites. The sweet and nut surprises reminds me of Waldorf salad, expect that this mast-o-khiar is much lighter and does not use mayonnaise. 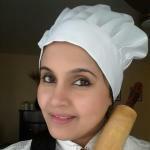 I prefer to use fresh herbs for optimum flavor, but you may substitute with frozen or dried herbs too. If using dried herbs, you may replace the fresh herbs by up to 1/3rd dried herbs in quantity (3 tablespoon fresh = approx 1 tablespoon dried). When trying to hollow out the cucumber halves for making the appetizer style salad bites make sure to use a melon baller or a sharp utensil to scoop out the cucumber flesh very well, leaving a thin and firm exterior. This will ensure that the salad bite will have a good balance of cucumber and yogurt. If it is not hollowed out properly, then the salad bite will feel more like eating a cucumber with a tiny smear of yogurt. 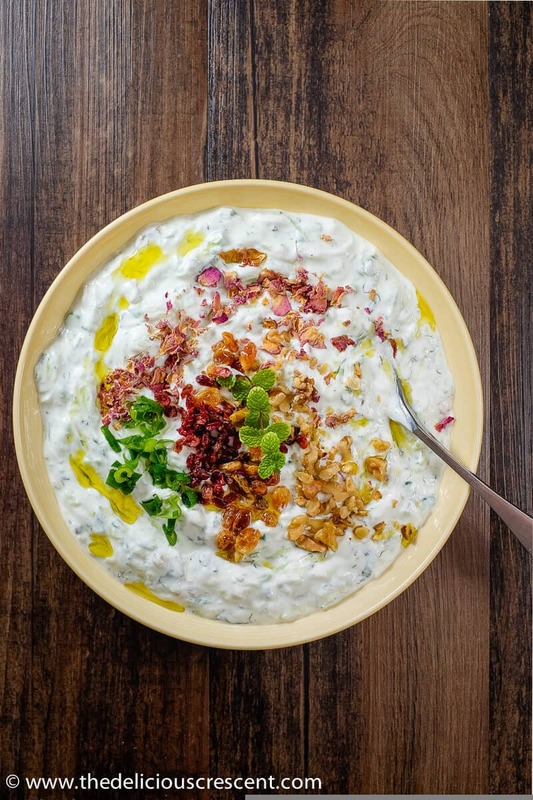 What are your favorite yogurt based dips and salads? What kind of recipes do you make with cucumbers? Did you try this Persian “Mast-O-Khiar”? Mast-o-khiar is a scrumptious classic Persian salad of cool cucumbers with creamy yogurt, and infused with fragrant herbs. Presented here in two ways - as a traditional salad and in a modern appetizer style. It makes a great Persian style appetizer that is quick, easy, vegetarian, low carb and gluten free. Scrub the surface of one cucumber using a vegetable brush and rinse well. Chop into small pieces. 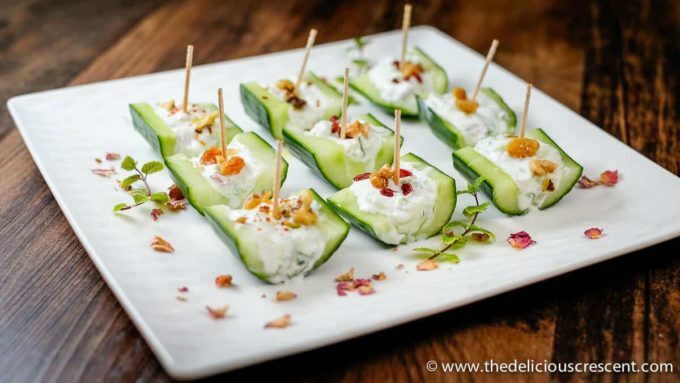 Alternatively you may grate the cucumber, especially for making the appetizer style cucumber yogurt salad bites. Drain any juices very well. It should yield about 2 cups grated cucumber. In a mixing bowl, combine cucumber, yogurt, garlic, dill, green onions, mint, and ground rose petals. Season it with pepper and salt as per taste. Add raisins and walnuts if you prefer. The addition of these ingredients is most suitable if preparing it for the appetizer style cucumber salad bites. Chill the mixture for one to two hours. If serving it as a traditional salad, then transfer the mixture to a serving bowl. Garnish with rose petals and mint to finish off the Mast-o-khiar. If serving it as cucumber salad bites, then take the other cucumber, scrub and rinse the surface very well with a vegetable brush. Cut off the ends of the cucumber. Then using a sharp knife cut it lengthwise through the center into two long halves. Using a melon baller scoop out the center portion of the cucumber to create a hollow cavity along the length of the halves. Then cut the hollowed out cucumber halves into smaller pieces. Using a small spoon fill these with the cucumber yogurt mixture. Garnish the yogurt cucumber salad bites with rose petals, mint, red pepper flakes, walnuts, raisins, barberries etc. Place the cucumber salad bites on a serving platter and insert toothpicks to make it easy to serve. 1. Dried mint, dried dill, dried barberries are available online and at Persian and middle eastern grocery stores. 2. Be sure to review the preparation tips mentioned above in the blog post. * Not including any added salt, optional and garnish ingredients. That looks delicious, I love the way cucumber is used in Persian and Indian foods! This is the most gorgeous salad!! I’ve actually never heard of mast-o-khiar, but now I want to make it! Thanks Sues. Let me know what you think. This is so fresh and healthy looking. I need to make this for my cuke lovin’ niece. Thanks Ginny. Hope you and your niece will enjoy it! Wow I don’t think I’ve ever tried cooking a Persian dish but I think I’d love the flavors! I definitely love cucumbers + yogurt together! Thanks Liz. Persian food is quite delicious. Hope you give it a try.